An alien race has hit the Earth in an unrelenting assault, unbeatable by any military unit in the world. Major William Cage is an officer who has never seen a day of combat when he is unceremoniously dropped into what amounts to a suicide mission. Killed within minutes, Cage now finds himself inexplicably thrown into a time loop-forcing him to live out the same brutal combat over and over, fighting and dying again…and again. But with each battle, Cage becomes able to engage the adversaries with increasing skill, alongside Special Forces warrior Rita Vrataski. Frankly, thus far I am very disappointed about the movies I was looking forward to for so long. In “Godzilla” the infamous monster was totally absent, “Transcendence” was too ordinary and meaningless, “Divergent” was just another SF Fantasy tale for teenage girls, “300 Rise of an Empire” was just like “300“, “The Expendables 3” looked exhausted and are in need of a replacement and “Pompeii” was a storm in a teacup. Only “Robocop”, “Guardians of the Galaxy“,”Maleficent” and “Captain America: Winter Soldier” could surprise and enchant me. I wasn’t expecting much from “Edge of Tomorrow“. Partly due to the fact that Mr. Cruise probably would be shining on the screen again the way he always does. That’s what I thought! What a big mistake that was. 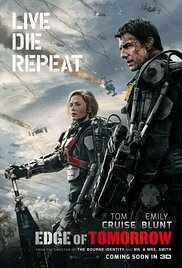 For me “Edge of Tomorrow“, a film based on the Japanese comic book “All you need is kill” by Hiroshi Sakurazaka, is already THE summer blockbuster. Imagine an invasion on a vast coastline in France as in “Saving Privat Ryan“, but this time in a more futuristic perspective. High-tech helicopters flying through the sky and dropping “Robocop“-like soldiers on the beach, who immediately start a massive battle against fierce aliens, called Mimics, who look as if they appeared in “The Matrix“. You get an adrenaline boost while watching this battlefield with advancing forces being massacred. And in between is a pity looking Colonel Cage (Tom Cruise) who in an inexplicable way got promoted from Colonel to an ordinary soldier with an indelible stain. He turns out to be a deserter, so to speak. He gets an ultra modern combat equipment and he’s ordered to be part of the first platoon which will lead the invasion and will throw itself in the middle of this bloody war. Ironically, he has no idea how to turn off the safety of his Japanese speaking equipment, and so he’s killed almost instantly. Due to circumstances however, he ends up in a sort of time-cycle like Bill Murray experienced in “Groundhog Day“. He goes back in time again and again to the moment when he wakes up at the base from where the invasion is coordinated. Only some questions remained. Why exactly was it that particular point in time ? Was it Bill Cage who determined this ? Maybe I’ve overlooked the answer or I misunderstood something. But don’t let this spoil the fun because it’s a fascinating, action-packed, exciting and sometimes humorous stunner of a movie. Even the presence of Cruise didn’t bother me. Normally Cruise is such an actor who has such an ego and pretentiousness that the screen is filled with his personality anyway. This was better than expected. Even his room wide dazzling smile shrank perceptibly. And to be honest, this film is fun for all moviegoers. Those who can’t stand Cruise may rejoice about the fact that Cruise gets exterminated numerous times. Those who idolize Cruise can be thrilled because he comes back to live over and over again so he can restart the mission as a true hero. Doug Liman created a heart-pounding raging SF. It’s something like “The Bourne Identity“. A successful concept and probably because of the extremely devious put together script. Despite the fact that the same event is repeated a few times, this isn’t really disturbing, because Bill Cage attempts to tackle the situation each time in a different way. And this leads sometimes to hilarious moments. As said before, the rather timid Tom Cruise played an enjoyable role as Colonel Cage. But the moment Emily Blunt appears on the scene as Rita Vrataski, “The Angel of Verdun”, everything speeds up and the interactions and fragments become humorous and entertaining. She’s the perfect choice as the fierce female soldier who’s also extremely attractive at the same time. I remembered the days when I sat at home before my monitor for hours struggling with an extremely difficult mission in “Call of Duty”. Frustrated I always started over again trying in a different way till I succeeded to fight my way through it. The same principle is used in “Edge of Tomorrow“. Also, there were two noteworthy supporting roles. Brendan Gleeson played the ruthless General Brigham and you can see Bill Paxton in a very amusing role as the drill sergeant Farell. It’s obvious I’m really enthusiastic about this movie and had a great time watching this highly entertaining movie. It’s certainly a candidate for the title of “Best action movie” of the year 2014. The other candidate competing for this title is for me “Captain America: Winter Soldier“. And right now it’s a tie. Despite the end being a bit illogical, this SF is highly recommended. A lot of action packed scenes in a furious pace. A dazzling spectacle with some contagious humor and surprising plot twists. Fortunately a corny romance was omitted. And finally, Tom Cruise effacing himself in relation to the whole picture. All this makes this film a must-see. And I’m going to do something I rarely do: I’m going to re-watch it !